The idea of being able to pay for goods and products from your mobile phone is gathering speed. Most people like the comfort and convenience that comes from being able to pay in this way although there is naturally some hesitancy about the safety and security aspect of these devices and electronic wallets. Even though many users have utilised contactless payment systems with ease, every time that a customer is wrongly double charged for having a payment device close to the reader or payment system, it is big news. It is obvious that there is a need to ensure that these situations do not occur but in the grand scheme of things, these contactless payment systems are being deemed a success by industry experts and retailers alike. Vodafone customers in the United Kingdom will soon have the opportunity to join in with this very modern method of shopping. 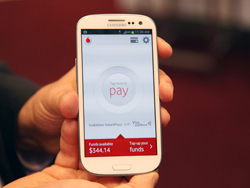 The Vodafone Wallet is lined up to arrive in the United Kingdom in the first quarter of 2014. This new system will enable consumers to pay for purchases, store their travel card, loyalty cards, gift cards and even their gift vouchers in one handy electronic wallet. Vodafone has worked with Visa to develop the Vodafone Smart Pass system, which utilises a Near-Field Communication system to pay for items. The system will be initially provided to HTC, Sony and Samsung users. Other features that will be made available to users including having the ability to check their balance, to transfer cash into their mobile device and to use a pin to pay for purchases in excess of £20. The Vodafone Wallet is being launched in Spain and German users will be able to get their hands on the system in December of this year. After these two countries, the roll out continues in 2014 with Italy, Holland and of course, the United Kingdom gaining access to the wallet. Vodafone says it has been engaging with banks across Europe to ensure that their cards and accounts integrate fully with the wallet. The wallet has been receiving vigorous training and testing throughout the year at the Vodafone campus in Newbury. The company is fully behind the user of this wallet and they have been quick to promote the benefits it will offer to all of their users. Vodafone believes that the new wallet will offer a greater level of speed, convenience and simplicity to all of their customers and the everyday transactions. Vodafone has also been quick to point out that their wallet is open to all third party companies and providers. This means that banks and financial institutions have the ability to integrate fully with the system and Vodafone hopes to be able to provide the most comprehensive service to their clients. The involvement of Visa is clearly a big part of the launch focus and it should provide confidence to all users. When it comes to the world of credit cards, bank cards and cash, Visa is the name that the world trusts. This is something that Vodafone has been very smart to integrate into their system and it is likely to provide many new customers with the confidence that is needed to utilise an electronic wallet.